It goes without saying that construction is a high-risk industry, but recent statistics show that the term “high-risk” might be deemed “extreme-risk” instead. In 2010 alone, WorkSafeBC saw some 14,405 claims from BC construction sites. Of these, 7,620 were health-care-only claims, 6,014 were short-term disability claims, and 739 were long-term disability claims. There were thirty-two fatalities, and of those, 19 were due to occupational diseases. As such, construction has the highest number of work-related fatalities in any industry in British Columbia. Recognizing the need for change in the construction industry (as in workplaces everywhere), WorkSafeBC has partnered with The Community Against Preventable Injuries and BC-based employers for the WorkSafeBC-Preventable Construction Signage Pilot Project. The project aims to remind everyone on construction sites – from employers to workers to visitors – to employ the required safety precautions. Safety signage will be posted at construction sites across the province, with posters hung in work zones and large magnetic signs displayed on equipment. The message will also be extended to the general public, with large signs posted on the external perimeters of worksites, such as guardrails and fencing. 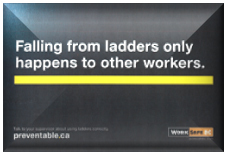 Construction site signage will display safety messages in white text on a black background, blatantly stating some of the assumptions that workers make that can lead to serious injuries – and often have. One message states “Being struck by moving equipment only happens to other workers”, while another states “Only other workers need to tie off at heights”. As obviously wrong as these statements may seem, perhaps employing this reverse psychology might prove effective. The signage initiative was unveiled in June 2011 at Stuart Olsen Dominion’s BCIT Broadway Tech Centre #4 construction site, the first of eight pilot sites across BC that will be displaying safety signage. Four other pilot sites are also located in the Lower Mainland and the three other sites are located in Esquimalt, Kamloops and Prince George. Other employers on the pilot sites are ITC Construction Group, Kindred Construction Ltd., Lafarge Aggregate & Concrete, and PCL Construction. As with the recent WorkSafeBC initiative that introduced safety signs in “Cone Zone” traffic construction areas, Construction Signage Pilot Project aims to provide constant reminders to employees, employers, and the public alike, that safety is key at all times.